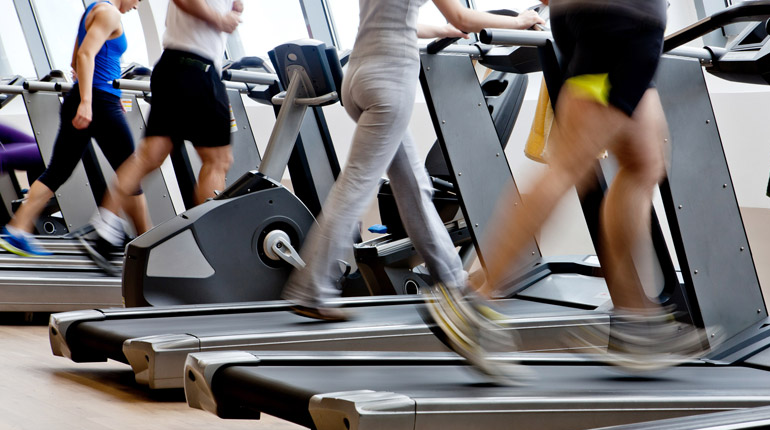 WHAT IS THE BEST RUNNING OR WALKING SPEED ON A TREADMILL? Whether you running for losing the extra kilos or just to stay fit, whatever be the cause, running or walking at a right speed has to do a lot with your workout session, you must know about the right speeds of treadmill in order to achieve desired results. If you are a fleet-footed runner, you must be aware of these things but if you’ve just started or hit the gym just a while ago, it is important for you to know these details. It is only good to be aware. In general, the normal speed for walking ranges from 3 mph to 4 mph while, for running it ranges from 5 mph-7 or 8mph. But it all comes down to depending on the individuals using treadmills. Initially, the warm up jog should be at slow pace, which may range anything from 3-5 mph for 5-10 minutes. This jog shouldn’t make you unable to speak fully fledged sentences. Start with keeping this mind. The right speed depends on the runner’s body, his heart rate and age and fitness level. For some, 20 minutes per mile is too fast and for some the same is either moderate or too slow. So, it clearly depends on your own strength and endurance level. There are two zones of exercising, namely, intensity zone and moderate intensity zone. You must understand what these two mean to be able to design your treadmill workout. Getting hold of the mathematics is pretty simple; all you require is some common sense and knowledge about your own body. So, when you’ve finished the starting phase i.e. you have done the brisk pace walking or jogging, it is time to upgrade. Increase your speed gradually, and shift it from 3 mph to 4 mph or. This is the advanced phase. Depending on your own fitness level, choose a speed. It should make you feel an urge to breathe more but not obstruct you from talking properly. You must be able to have conversation. When your body has easily surpassed these two phases, you must now go one step ahead and add interval training to your workout session. Interval training means to shuffle. It strictly means to shift from walking to jogging or running for an interval of 30-90 seconds each. For instance, walking for a minute and then shifting to jogging for the next 1 minute, for 3 minutes or more. This whole workout scheme needs to be done for at least 30 minutes with ample intervals of break. Relaxing too is pretty much important which means, if you are walking at 3.0 mph for 1 minute, shuffle it with running at 5.0 mph for 1 minute and then take a break of 30 seconds and relax. Running faster burns more calories which in turn results in muscle development and fat reduction, in order to find out your ideal speed for running, you require monitoring your heart rate and breathing rate. Experts have opined that one must exercise in the range of 60-80% of the total heart rate. The ideal speed largely depends on how much your heart rate and breathing rate changes when you exercise. You must slow down if it causes you any trouble, after all hurting yourself isn’t what you want, right? As already mentioned, while exercising your breathing rate must increase but the speed shouldn’t obstruct you from talking. If you feel, you are able to sing too, increase the speed. Clearly, designing your workout will require some research and loads of common sense put together with alertness. You must be willing to challenge your body yet be careful of not hurting yourself. In layman language, exercising must be extensive and exigent but it shouldn’t be injurious. In essence, you need to examine your strength, capabilities and weaknesses to get your specific ideal speed or what we know as the target workout zone. The speed should be apt to make you last for 20-30 minutes on the go. It should be fast enough to burn the calories hike up your heart and breathing rate and make you sweat. One more piece of advice for all you runners is to maintain the longevity of the session. Don’t be too fast to end the session within a few minutes. Make it a bit longer and effective. Since, it is quite evident that the same speed is not correct for all the bodies. Thus, finding it out by yourself is the best way possible.